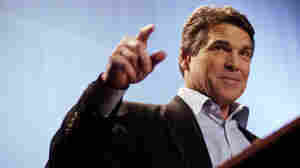 June 21, 2011  The former Utah governor is getting into the race for the 2012 Republican presidential nomination. 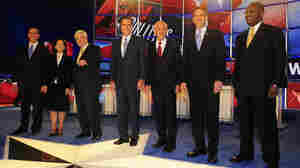 June 14, 2011  And contenders for the 2012 Republican presidential nomination used the forum to attack President Obama's policies, rather than each other. June 9, 2011  Aides complained that he wasn't doing what was necessary to get his campaign off the ground, NPR's Mara Liasson reports. June 6, 2011  The patriot did tell the British that 500 armed men were ready to fight them. But that was after he was captured and briefly held. Still, Palin says she was right to say Revere "warned the British that they weren't going to be taking away our arms." May 27, 2011  "I'm going to think about it," Perry said today — a much different statement from his past denials of interest. Image at left Courtesy of The Hill; image at right courtesy of the Newseum. 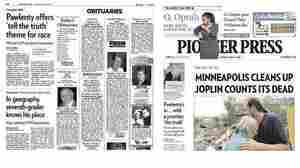 May 24, 2011  Stories end up in certain spots on newspapers' pages for all sorts of reasons — how important they are; what time they break; how long they need to be. St. Paul's Pioneer Press had a rather unfortunate juxtaposition Monday. May 22, 2011  I was able to resolve every competing consideration but one," he told supporters in an e-mail. "The interests and wishes of my family" won out. 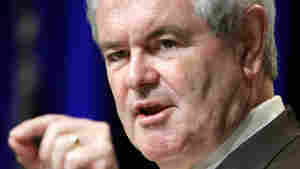 He is a favorite of many in the GOP establishment. 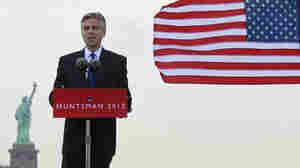 April 11, 2011  The former Massachusetts governor, who ran for the Republican nomination in 2008, is going for it again. April 4, 2011  In an e-mail, Twitter message and video, the Democratic president lets supporters know he is — as expected — going to seek a second term.